10:00 pm update: Please make sure to read the comments underneath this post — I’ve added a few more article and videos. Also please see the Calendar of Events. The movement to Occupy Wall Street (OWS) has been building for the past month. Until just recently, there were very few Buddhists writing on the subject. Over the past week, I’ve come across a number of essays and statements on OWS coming from Buddhist voices. I’m sharing and summarizing the ones I’ve found below – if you have more to add to this list, please write in the comment section. Some of these will be featured in next week’s Upaya Zen Center e-newsletter, which always includes fascinating and provocative articles from the dharma world (and beyond). • In “We Are the 100%,” Ari Pliskin of the Zen Peacemakers offers a “mindful response” to OWS. Drawing on the precepts and particularly this one: “When peacemakers vow to be oneness, there is no Other,” Ari’s piece makes the case for a non-dualistic view of the current situation. Posted in SEB News and tagged Buddhism, Buddhist Peace Fellowship, Occupy Wall Street, Zen Peacemakers. Bookmark the permalink. You can find the entire talk at the http://www.whatmeditationreallyis.com blog. I made the video and the mic he is wearing on his sweater is mine so the sound is really good. 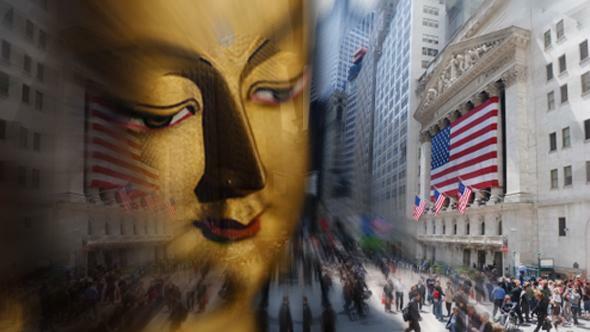 #OWS gives Engaged Buddhists an opportunity to raise questions. Maia, your quote from Robert Aitken Roshi, is interesting – “there is no Buddhism that is not engaged”. We are alive, we are compassion, we are engaged. But there are many Buddhists who choose to be disengaged. Many teachers are monks who have chosen refuge. Do they understand the world we live in? Yet these monks teach us, and it becomes easy to see Buddhism as not extending beyond the cocoon of the institution. #OWS is telling us that 1% are exploiting. The 1% are greedy, and in their greed they affect all society including Buddhists. Hopefully OCCUPY will spread enough that governments will respond. In my own Buddhism I got sucked into the institutional mentality, and have only just broken out of it. This is reflected in my blog, http://zandtao.wordpress.com, that has become perhaps too political – especially as OCCUPY then started. May the 1% join with the 99% in compassion, in caring, in Unity – or at least they could pay some taxes and allow their government to find people jobs. This STATEMENT OF CORE VALUES is in process of development at Occupy Santa Cruz. We are not sure that this will pass our general assembly but hope it may be of use to others. We address this statement to our selfs, taking conscious and aware responsibility for the knowledge that all beings are created interconnected, and that each, whether they be human, animal, plant, mineral, all affects the existence of the whole as they secure the unalienable needs of all beings for their own forms of food, shelter, and rest. Seeing that the strength, happiness and survival of our being is interconnected with all others, we commit ourselves to uphold the supreme ethics of compassion, respect, love and mutual consent, and to work on an individual, societal, and global level, on behalf of the organic unity of all creation. The Providence Institute and other members of the Meditation Flash Mob: Providence plan to do an hour of sitting meditation at Occupy Providence Thursday, 10/20, at 8PM. PI Director will ring a gong to begin and end. It should be simple, just a demonstration of quiet love and dignity. The Institute is about a 15 minute walk from the park. We have a meditation class from 5:30-7, so if anyone is new to meditation and feels moved to join us, they can come to class and then walk over with us. Possibly this will initiate a contemplative space of mindfulness, and as Madrone witnessed in NY, a space where people can connect with their deep selves to stay grounded and focused on a positive path during the occupation. We need to bring our mindfulness to our activism.